This is a second protest this year. The first protest on July 23rd was great! 35 amazing activists stood together for the horses. Two horses died at Saratoga that very same day while racing. 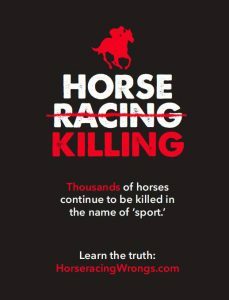 Please join this second protest with other animal advocates to protest the brutal business of horse racing at Saratoga Race Course.